RBKC did a plan. 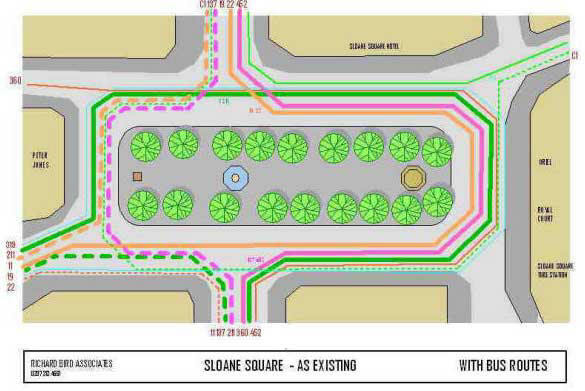 Save Sloane Square Action group did a plan. Neither was ideal. This is our suggestion. Why should the Square be changed at all? It's a traffic-dominated mess. The central island is totally isolated from surrounding buildings by traffic. All bordering pavements and buildings are affected by noise and pollution. The elongated roundabout system creates far longer journeys through the square than with any other conceivable layout. The plan of existing bus routes on the left shows this. There is a dire need for additional pedestrian space at the eastern end of the Square in front of the Tube Station, Royal Court Theatre, and Oriel Brasserie..There is a need to improve pedestrian access from the Tube Station to all parts of the Square, to Peter Jones, Kings Road and Sloane Avenue and ideally to Cadogan Hall and the new Saatchi Gallery as well. 78% of those favouring the Council’s plan gave their reason as wishing to improve the pedestrian realm. 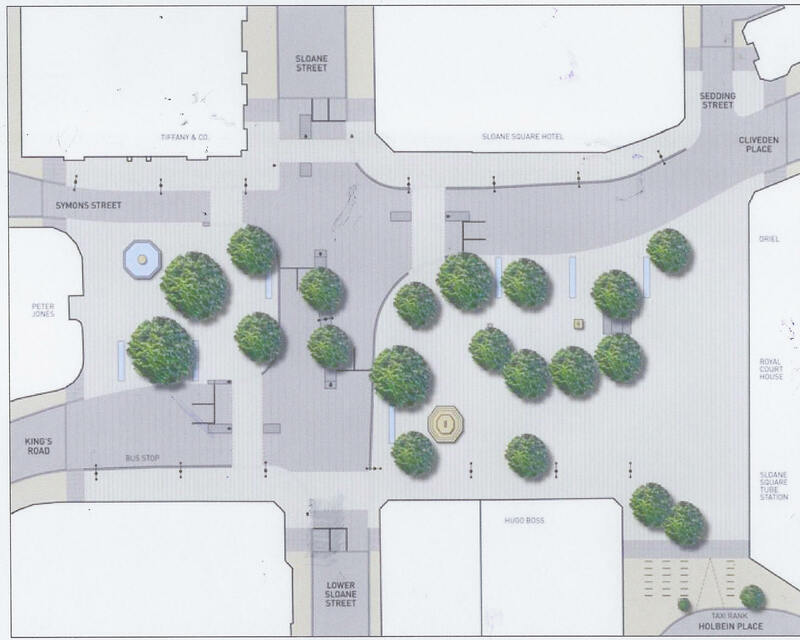 We have looked at the Square and its history and believe that there is a simple solution which meets the expressed wishes of the majority of the interested parties, which dramatically improves the pedestrian realm, reduces traffic dominance, and makes the central island accessible. The details of the proposals are given below, which we have somewhat cheekily called the “Smarter Sloane Square” Options. There are two options, each aims to provide the maximum improvement with the minimum of disruption and cost. A spacious pedestrian area is formed at the eastern end of the Square, linking the island to the frontages on the east and south-east sides, where it is most needed. The new paving is level with the island surface, but in a different material in order to preserve the historical integrity of the original island. 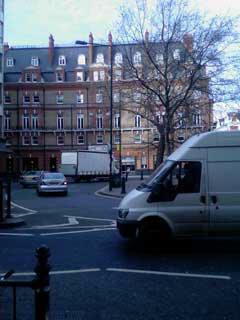 Pavements are widened in front of the Sloane Square hotel and Peter Jones. 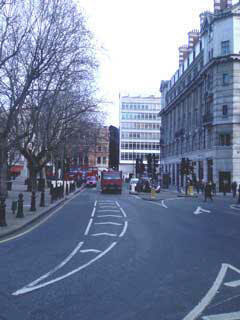 A wide crossing is formed leading to Cadogan Hall and the Sloane Square Hotel on the north side. Traffic here is calmed by raising the roadway to pavement level, with low bollards marking the carriageway. Pavement tables and chairs are encouraged in front of the Royal Court, Oriel Brasserie and Sloane Square Hotel to contribute further to the “continental” ambience of the square. 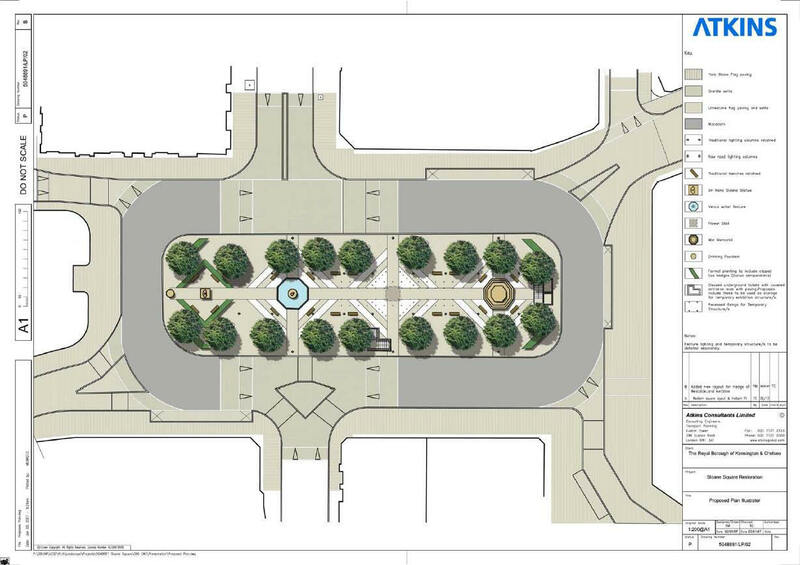 Traffic is accommodated around the west end of the square with a series of mini-roundabouts. Pelican crossings at the main entry roads are provided to regulate traffic flow. 5 m (16ft) is taken off the western end of the central island and the roadway is widened. Only two trees are lost. The end of the island is repaired to re-form the subtly cambered surface as at present, so that on completion there will be no obvious sign that anything has been removed. Otherwise the island is retained without any disturbance to its features, although improvements to the surfacing and street furniture could be considered. Some traffic is permitted to drive across the pedestrian area for access to the buildings in particular the Royal Court backstage, with access controlled by raising bollards. Holbein Place is closed from the Square. This will mean that some extra traffic is generated down Lower Sloane Street by residents gaining access to Sloane Gardens and Holbein Place. However a substantial amount of through traffic at present passes through Holbein Place en route to Pimilico Road, and through Sloane Gardens en route to Chelsea Bridge Road, and this would be eliminated, The net effect would thus be a significant reduction in total traffic in Holbein Place and Sloane Gardens. The total cost and timescale of these improvements are expected to be far less than that of the Crossroads scheme, and with much less disruption. Preserves over 90% of the central island and its trees and retains its essential iconic character. The Venus Fountain is kept as the focal point of the main approaches to the Square, as intended by the original designers. The War Memorial is undisturbed. Greatly enlarges the pedestrian space in the eastern part of the square where it will be well used and appreciated, with frontage attached to the Royal Court and Oriel Brasserie allowing for outdoor dining and café tables. Gives safe level access to the central island. 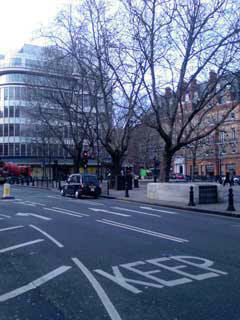 Greatly improves pedestrian routes from the Tube Station to Kings Road, Peter Jones, Sloane Avenue and Cadogan Hall. Greatly reduces the lengths of traffic journeys through the square, with consequent reduction in noise and pollution. Simplifies bus routes and gives a good traffic flow without extensive signalling. Minimises overall cost and disruption. This is similar to the preferred option but the difference is that access to Holbein Place is kept open. The road is levelled with the pavement as on the North side.. Other than that, essential features are the same. The pedestrian area is smaller but the island is still directly linked to a spacious piazza in front of the Royal Court. We believe that either of these schemes meets the expressed wish of the majority of people consulted in the 2006-7 Consultation to retain the essential character of the Square, and at the same time goes a considerable way towards meeting the understandable wishes of the Council to improve the urban environment in the Square for the benefit of residents and visitors alike, and to simplify traffic routes in the area. Copyright Richard Bird Associates 2008. No part of this study may be reproduced without permission. Bus routes are simplified and much reduced in length in contrast with the present layout. (e.g. 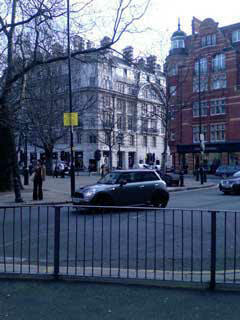 from Sloane Street or King’s Road into Lower Sloane Street.) Road widths have been checked to ensure that the largest vehicles can negotiate the junctions. People arriving at the Tube Station emerge onto a generous pedestrian area. Taxi ranks are easily accessible without crossing any roadway. Access to Kings Road involves only one crossing, at Lower Sloane Street. 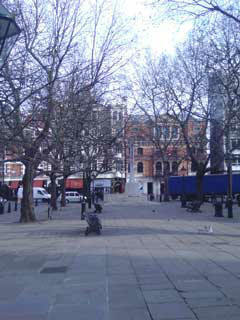 Access to Cadogan Hall and the Sloane Square Hotel is much improved in contrast to the present situation. Access to Peter Jones involves just two crossings, at Lower Sloane Street and Kings Road, with a possible crossing direct to the central island subject to traffic engineers approval. Cycle racks can be provided around the new square. Motorcycle/scooter parking bays are provided in Holbein Place. The plan was effectively predetermined by the main requirements of the brief given to the designers by the Save Sloane Square group. i.e. Widens pavements around the square. Forms ramped surface crossings around the square to calm traffic. Access to the island is still solely across the major traffic flow, which has to be interrupted to allow people to cross. Widening of pavements would be welcomed, but no real extra provision is made in the place where it would be most appreciated and useful and demand for it could be considered to be the highest i.e.at the eastern end of the Square in front of the Underground Station, Royal Court Theatre, and Oriel Brasserie. Reduction of the carriageway width especially at the east and west ends of the Square would considerably hamper traffic flow in the gyratory system. Pedestrian ‘desire lines’ from the Tube are not well provided for. A large pedestrian area is provided at the eastern end of Square where demand for it is at highest and it would be most useful and appreciated. A pedestrian area is formed in front of Peter Jones which would improve the setting of this listed building. Traffic is removed from almost half of the frontages of the square. The Square is bisected and dominated by a major through route, and its present formal integrity is lost. The two pedestrian areas give the impression of being ‘left-over’ space after the roads have been laid down, with no real urban design quality. Randomly scattered tree planting and "water features" add to this effect. There is no creation of a memorable place. Many existing trees would be removed. The War Memorial and Fountain both have to be moved, at significant cost and their new locations seem haphazard and inappropriate. The pedestrian area in front of Peter Jones appears to be of little value other than decorative as there are no active frontages onto it to give it a useful “life” (other than the door of Peter Jones), and it is encircled on three sides by roadway. The effect on east-west traffic flow is unclear but could be adverse. Access to Cadogan Hall is not improved. The 2006-7 Consultation was carried out by ICM who gave detailed analyses of the reasons given by people for preferring one option to the other. In view of the very useful assessment of public opinion obtained in that study, we decided to analyse their results. Since the Option A voters represent more people than the Option B voters, the basic percentages above are slightly misleading. Adjusted figures in brackets have therefore been added in order to show the relative proportions of votes in terms of total actual votes. The common factor in these reasons, representing the opinion of 78% of those voting for Option A, and 55% of the total of voters is that they want as far as possible to keep the essential character of the existing Square, which is seen as an iconic landmark with heritage value, in keeping with the area. The Square does indeed have a special character which may have been the intention of the designers, or just a happy combination of features. It has a “Parisian” feel, the sort of place which could be found in the quieter backstreets of Paris, due to its smallish scale, the formal planting of plane trees, the decorative fountain with statuary, and the subtle camber of the paved surface, All these add up to make it a striking and unique icon in the London scene. Given this, it is understandable that 78% of those voting gave its retention, more or less intact, as the main reason for choosing Option A. From this it is clear that any proposal to totally erase the existing Square design is likely to meet fierce opposition from local residents and many other parties London- and nation-wide. These strong and firmly entrenched views would have to be carefully considered by the Council when looking at any possible improvements to the Square. The common factor here is a desire for improvements in the pedestrian realm. These views expressed by 78% of those favouring Option B will need to be considered in any future proposals. Respect and take into account the public views expressed in the 2003 and 2007 Consultations. a. Improve pedestrian access from the Tube Station to all parts of the Square, to Peter Jones, Kings Road and Sloane Avenue and to Cadogan Hall. b. Enlarge the area of pedestrian space, in particular on the eastern frontage (Royal Court and Tube Station) and if possible on the western frontage (front of Peter Jones), and other pavements where possible. Reduce the area of road space as far as possible. Create a new urban design which is of equal or better quality to that existing, with a real sense of place. Respect the location of the Central Fountain as a visual focus for the major routes into the Square, and a symbolic link between the surrounding areas. Maintain traffic flow close to the existing levels. Maintain essential road access to buildings, in particular Royal Court backstage access. Provide bus stands and stops to replace existing. Retain existing trees where possible.